The American Confederate general Albert Sidney Johnston was born at Washington, Mason county, Kentucky, on the 2nd of February 1803. He graduated from West Point in 1826, and served for eight years in the U.S. infantry as a company officer, adjutant, and staff officer. In 1834 he resigned his commission, emigrated in 1836 to Texas, then a republic, and joined its army as a private. His rise was very rapid, and before long he was serving as commander-in-chief in preference to General Felix Huston, with whom he fought a duel. From 1838 to 1840 he was Texan Secretary for War, and in 1839 he led a successful expedition against the Cherokee Indians. From 1840 to the outbreak of the Mexican War he lived in retirement on his farm, but in 1846 he led a regiment of Texan volunteers in the field, and at Monterey, as a staff officer, he had three horses shot under him. 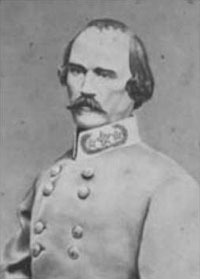 In 1849 he returned to the United States Army as major and paymaster, and in 1855 became colonel of the 2nd U.S. Cavalry (afterwards 5th), in which his lieutenant colonel was Robert E. Lee, and his majors were Hardee and Thomas. In 1857 he commanded the expedition sent against the Mormons, and performed his difficult and dangerous mission so successfully that the objects of the expedition were attained without bloodshed. He was rewarded with the brevet of brigadier-general. At the outbreak of the Civil War in 1861 Johnston, then in command of the Pacific department, resigned his commission and made his way to Richmond, where President Jefferson Davis, whom he had known at West Point, at once made him a full general in the Confederate Army and assigned him to command the department of Kentucky. Here he had to guard a long and weak line from the Mississippi to the Alleghany Mountains, which was dangerously advanced on account of the political necessity of covering friendly country. The first serious advance of the Federals forced him back at once, and he was freely criticized and denounced for what, in ignorance of the facts, the Southern press and people regarded as a weak and irresolute defence. Johnston himself, who had entered upon the Civil War with the reputation of being the foremost soldier on either side, bore with fortitude the reproaches of his countrymen, and Davis loyally supported his old friend. Johnston then marched to join Beauregard at Corinth, Miss., and with the united forces took the offensive against Ulysses S. Grant's army at Pittsburg Landing. The battle of Shiloh took place on the 6th and 7th of April, 1862. The Federals were completely surprised,and Johnston was in the full tide of success when he fell mortally wounded. He died a few minutes afterwards. President Davis said, in his message to the Confederate Congress, "Without doing injustice to the living, it may safely be said that our loss is irreparable", and the subsequent history of the war in the west went far to prove the truth of his eulogy. His son, William Preston Johnston (1831-1899), who served on the staff of General Johnston and subsequently on that of President Davis, was a distinguished professor and president of Tulane University. His chief work is the Life of General Albert Sidney Johnston (1878), a most valuable and exhaustive biography. William Preston Johnston, The Life of Gen. Albert Sidney Johnston (1878).